You think police flashlight is just for police? Well, think again! A police flashlight, not only has the use of lighting things up as traditional ones, but also have many further abilities which can save your life in some situations. Get to know this, you would want to put it on your list of daily stuff to carry along. 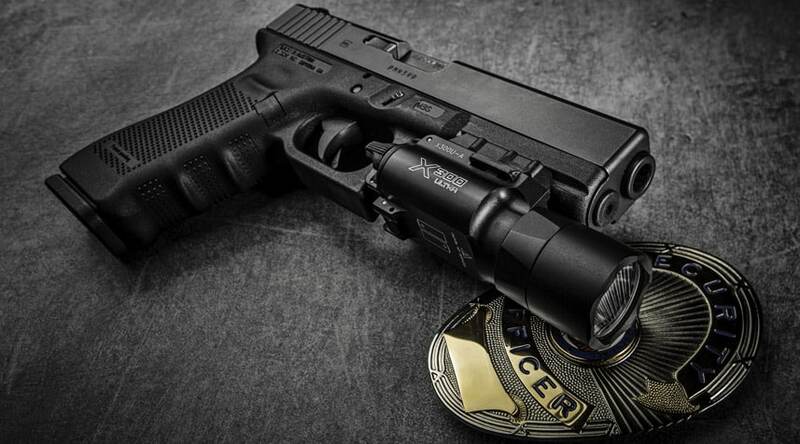 Start to find your best police flashlight with our list below. What is a Police Flashlight? What Makes a Police Flashlight Stand Out? What Can a Police Flashlight Do For You? 4. QuiqLiteX Hands Free Pocket Concealable Flashlight – The Most Convenient Flashlight for Both Hands Using. What Should You Look for in a Police Flashlight? What makes a police flashlight different? Obviously the “police” part. 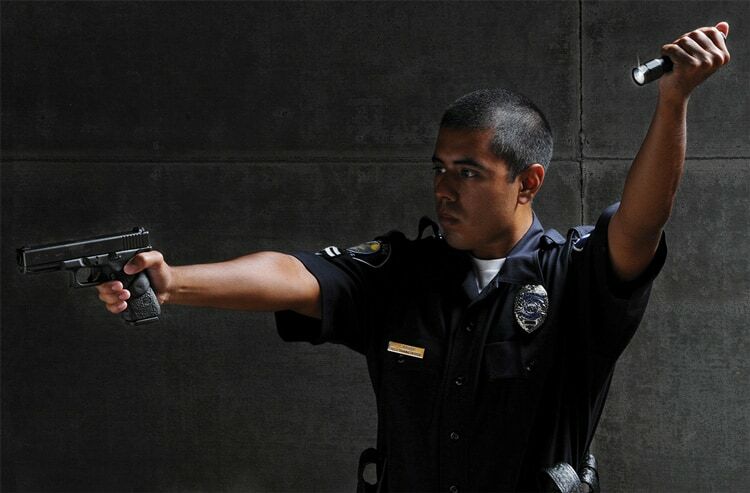 A police flashlight is designed for police, military, in overall is for tactical use. That’s why they also are known under the name tactical flashlight. 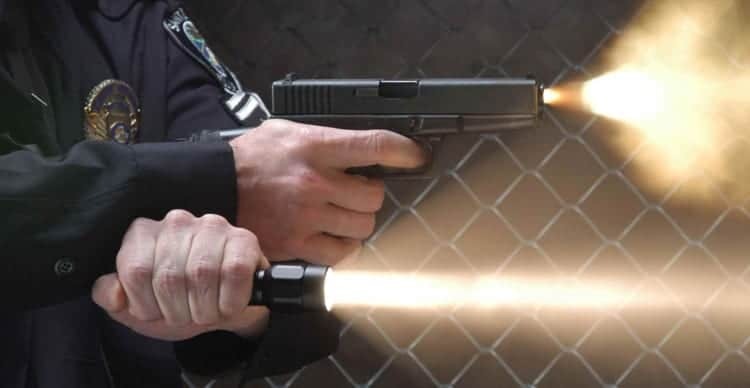 These flashlights are used in conjunction with a firearm in a low-light environment, allows the police officer or soldiers to identify the target and shoot them down. Police flashlights are divided into different kinds, the two most famous are handheld and weapon-mounted. Handhelds are generally used for handguns, but it doesn’t matter if you don’t have one. For the intended purpose, the flashlight usually available in narrow body which fit your palm. Some models have the rings designed to fit your finger, allowing the light to be used in case you need both hands on your gun, with the switch is related to the ring for easily controlled. More traditional models are available with convenient switches too, since the flashlight is designed for emergency use. Another feature which can be very useful is the ability to attach a lanyard to the light which allows it to be dropped when the hand is needed and quickly retrieved. Some small flashlights often have crown-like protrusions around the lens to enable its use as a weapon for closed strikes. How about having a flashlight attack on a nighttime mugger? Weapon-mounted, as its name, is mounted on guns for hands-free use. The switch now can be mounted somewhere on the gun within easy reach of the finger. These lights are commonly seen on rifles or shotguns, but nowadays there are small-sized flashlights used for handguns as well. The price of this kind is often higher than the former since it must be tougher to stand the recoil of the firearm. But if you are working with guns such as hunting, you should skip the details. The difference between a 90 lumens light and a 200 lumens light can surprise you. Why should you need a flashlight which is just better than a guy with good eyes a little bit? Especially in some emergency situations, a strong light can be a great power to drive danger away. Remember how people can stay safe from carnivals with just a campfire. Most of the police flashlight have small and simple designs in to be used at any time by anyone. You sure don’t want to read the instruction manual when danger is approaching in the dark. But obviously, if you can read about how to switch your light on even when there is no any light, a flashlight is no longer necessary. If you are reminded of its intended use, you’ll know police flashlights are tough. Most of them are impact resistance and water-proofed, some may show just a little bit lower quality after being wet. But unless you try to break them with a hammer or immerse them in the sink for the whole day, they are tough enough to be your reliable companies. Thanks to its special qualities, a police flashlight not only serves law enforcement but also available for a civilian in many purposes. Don’t underestimate a flashlight, especially a tactical one. This is the main purpose of flashlights. Walking to a parking lot or an alley on your way home at night and you’ll see how much you need one. Flashlights don’t stay in the list of EDC – Every Day Carry – just for fun. With a flashlight, not only you can avoid tripping on anything you can’t see, but also able to identify some more dangerous threats that hide in the dark. A robber or a stalker perhaps? 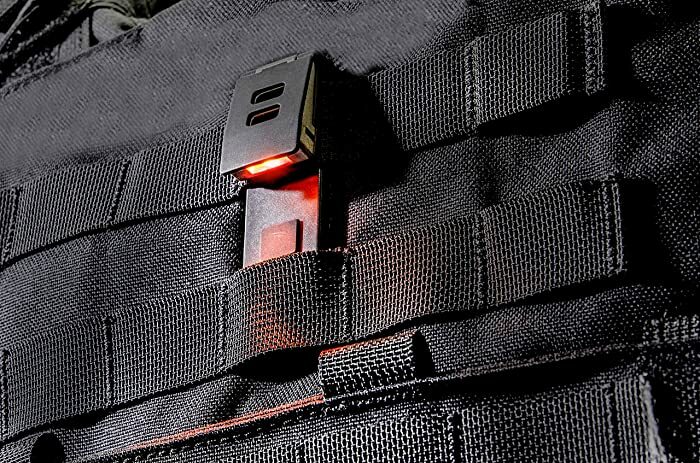 Not only weapon-mounted flashlights are suitable in this case just because it’s attached with a gun, police flashlights are designed to give users an advantage in a combat situation. Remember the toughness and the crown-like protrusions around the lens, or usually be called strike bezel? As its name, when an attacker approaches, you can strike the part onto his forehead and leave him behind with a memorable bruise while running away. But before that, you can also prevent him from approaching by flash the high lumens light in his eyes. He should be temporarily blind long enough for you to escape. In the emergencies which you see on movies, most of the time the power will go out. From a simple blackout to a natural disaster, having a flashlight by your side is always useful, especially the one would not easily break by the impact. For instance, if you are stuck under a building after an earthquake, a flashlight can help you find the way or just simply gives a signal to the rescuers. Seriously, this is the one that you sure meet more than any above situations. Have you ever drop your car key when trying to return home as soon as possible after a night shift? How many times that you have to crawl on the floor just to find some tiny little stuff just fell down the edge? Most of the times, I bet you would say “Wish I’m having a flashlight right here.”. 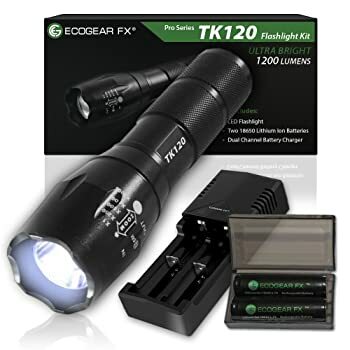 TK120 LED Flashlight from EcoGear FX comes with two rechargeable batteries, battery charger, and a durable storage box. The zoom lens allows users to focus the beam on a targeted area, which is useful if it is needed to see something specific in the distance. The 5 light modes which can be switched by pressing the tail-cap button then quickly release. The popular Strobe Light option is perfect for self-defense. At fully charged of the 18650 lithium ion battery, the high quality CREE XML T6 LED chip lets the flashlight reach its highest setting at 900 lumens and use the zoom feature to stretch up 1200 lumens. Although the 1200 lumens brightness and the 5 light modes are key features, most of the complaints have been made on these. The battery also suffers some complaints about it can’t be charged properly or quickly drained. However, it’s you who decides if the flashlight worth being tried out. Aluminum alloy construction helps avoid scratches or damage. Hard-anodized finish for water resistance. 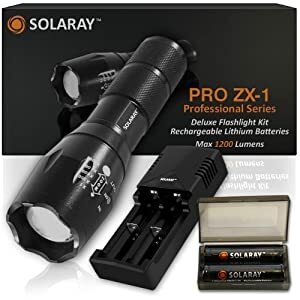 The Solaray Pro ZX-1 Professional Series Tactical Led Flashlight presents the ultra-bright of 1200 lumens. 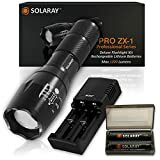 Five light modes including bright tactical intruder strobe for self-defense and SOS emergency signal mode, with versatile adjustable zoom lens. Water resistant aircraft grade aluminum body, quality lens, and premium tail switch for years of use. Rechargeable Solaray 18650 3.7v 3000mAh lithium-ion batteries embedded with a PCB (protected circuit board) for added safety. Can be recharged up to 500 times. Although it’s not the most expensive flashlight in the list, some comments prefer it not worth paying the product. The flashlight may not work as marvelous as you expected. Thus, the switching part may be difficult to use with the whole 5-mode thing. It takes times to cycle the button through all functions before reaching back the one you need. And the durability of the flashlight is under argument. Perfect fit size for fitting anywhere but also serves demanding lighting for outdoor needs. Balanced weight-to-size ratio makes it ideal for hand tools. 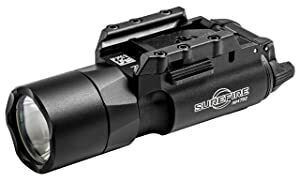 SureFire X300 Ultra Series LED WeaponLights with TIR Lens provides a smooth, tight beam with enough surround light for peripheral illumination, works for different ranges of application. One-finger ambidexter momentary and you can keep the switch on constantly. Extremely durable with the aerospace aluminum body and Mil-Spec hard anodized, also water-proofed. A high-quality product yet you can see the price is extremely high. However, most of the customers don’t find disappointed when purchasing the product, yet it depends on your opinion. Rail-Lock Mounting System helps easily attach and remove the flashlight from the handgun. 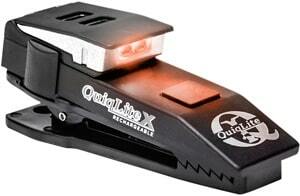 QuiqLiteX Hands Free Pocket Concealable Flashlight appears with various LED color options. Revolution design for the modern age, the small flashlight can be mounted on your shirt. It can be clipped anywhere to light up the place thanks to the 360 degrees swiveling alligator clip, thus free both of your hands for other purposes. The 400mAh Lithium ion battery can last 20 hours at 150 lumens bright, and up to 40 hours if it is 75 lumens. Micro-USB provides quick charge for 2.5 hours. The battery function can be improved with a 10-minute auto-off timer. The design of the product makes it convenient for writing in the dark, but definitely not for defending yourself. The brightness of the light isn’t that strong for the purpose, thus the outlook is not suitable to become any kind of weapon. It has small-sized, yet someone claims that it’s not small enough. The clipping part may be too bulky to stay fit inside your shirt pocket. Five modes of brightness with three modes of power each for widely changes. Hold the button for Strobe mode. SureFire E2D Defender Ultra Dual-Output Flashlight comes with the strike bezel, provides personal defense option. The LED emitter with TIR lens provides high density and long-range beam with enough surround light for peripheral vision. Two output levels: maximum light at 600 lumens and battery-saving at 5 lumens. The flashlight performs well at many aspects: brightness, durability, but the battery part receives the most complaints on doesn’t last very long. It is your decision to consider how is long enough. The most impressive part of the product is the strike bezel can also cause some problems because it’s sharp enough to cut your hand or leaves scratches on your clothes. Tail-cap switch: click for the constantly high level of light, return to off then click again to select the low level. Durable with the aerospace aluminum body and Mil-Spec hard-anodized. 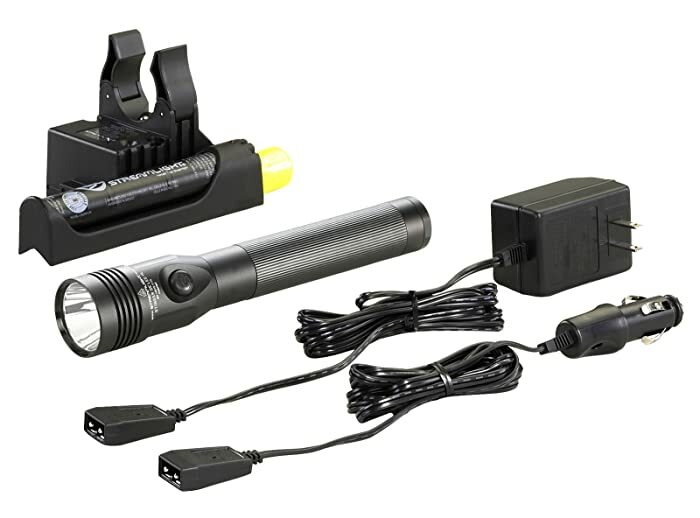 Streamlight 75458 Stinger DS LED High Lumen Rechargeable Flashlight comes along with 120-Volt AC/ 12-Volt DC Piggyback Charger. The NiMH rechargeable can reach 1000 times, NiCd battery is also accepted. C4 LED technology helps the life span of the light reach 50,000 hours. Three lighting modes and Strobe. The flashlight is considered very impressive itself. However, there are no warnings on the battery to tell you when the light is running out of battery or if it has already charged. One more problem with the charging, there are many complaints about how hard it is to insert and remove the light from its charger. Unbreakable polycarbonate lens with coating helps resist scratches. The anodized aluminum construction with the rubbered comfort grip prevents the flashlight slipping through your hands. Shock-proofed, IPX4 water resistance and 1-meter impact resistance have been tested. Streamlight 74751 Strion LED High Lumen Rechargeable Professional Flashlight comes with 120-Volt AC/ 12-Volt DC charger and 1 charger holder. C4 LED technology helps on extreme brightness and elongates the life span to 50,000 hours. Durable with anodized aluminum construction. Anti-roll head and knurled body help settle your flashlight whether on the table or in your hands. IPX4 water resistance and 2-meter impact resistance have been tested. The design of the flashlight makes it durable, yet someone claims it’s not big enough to use as a weapon against any surprise attacker. The light can afford it with the incredible brightness, but the battery can’t stay longer than 1 – 2 hours. Four light outputs including Strobe. Lithium ion battery with the rechargeable up to 1000 times. There are hundreds of models available on the market, which can easily confuse you from choosing one. But here are a few things you should consider in an ideal police flashlight for everyday carry. Since it is Everyday Carry, your flashlight should small enough to stay in your pocket or purse. It also should fit your palm for quickly picking and easily using. For a flashlight which should be an effective self-defense tool, it needs to bright enough to “blinds” the attackers. It is suggested to have more than 120 lumens for the job. As well as the beam distance, you would want to identify the threat before it catches you, right? Nowadays, anything can have multi-functions. That is one of the choices, but it should be better if you know what you are holding in your hand. As said before, you don’t want to read the manual when it comes to switching on your light. Some police flashlights may not have this ability, so remember to read the information carefully before paying anything. But it’s ok if you don’t need your flashlight to work in every condition, in that case just skip the part. You sure don’t want the flashlight to slip through your hand when you need it most. Consider the design and the material of the flashlight. The ones which made from hard anodized aluminum can be suggested. How does it go with the thought police flashlights are only for police? Now should be the good time to change your mind, isn’t it? Having a flashlight is super convenient, but choosing one obviously is a difficult task. I hope the lines above can help you in finding a suitable flashlight, but I’m sure you’ll see such complaints like “the light is not bright enough” or “it’s not worth paying” in the reviews below the product you’re intended to buy. However, don’t spend time worrying too much since you can see such comments on any other product online. Nothing is perfect, as soon as you’re satisfied with your choice, it should be the best police flashlight. Well, just in case there is any problem, they always have refunds, don’t they?